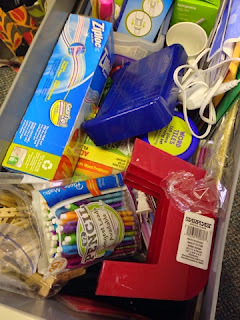 This month's "The Real Teachers of BLOG County" post is all about JUNK DRAWERS! Yes, even in our Pinterest inspired, perfect looking classroom, we all seem to have a junk drawer, maybe two....and they are actually file cabinet drawers! Eeek! Everything I could ever need is in here. It started out organized, but stuff keeps piling up! When my assistant needs something from in there, I kind of cringe when she opens it. She probably thinks I'm a hoarder! Once you see that all of these others bloggers are REAL teachers, you will feel much better about your own classroom! :) I sure did!!! I am having a lot of fun with this! Thank you so much for stopping by and linking up! Thanks for sharing! 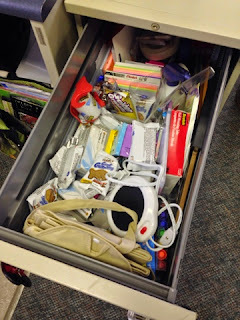 I'm glad I'm not the only one with more than one junk drawer!